If you are just starting out or considering starting to vape, you probably have a few questions. Okay, maybe more than a few, but you might feel foolish asking some of them, or even be afraid of what people’s reactions might be. It’s okay. Having some beginner questions is pretty normal. Here are a few of the most common questions you have been afraid to ask with some very simple answers. Will Vaping Save Me Money over Smoking? This is a good question, and one that does not have a simple yes or no answer like you would probably want. The deal with vaping is that it is an investment. You can certainly start off with a few cheap e-cigarettes if you want to, but you will wear them out quickly. It is a good way to see if vaping is right for you, but an expensive long-term solution. Eventually you will want to buy a more powerful and dependable vape. Of course, this will last you much longer than anything you used for cigarettes, but it will mean putting out some money up front. Simple mods like the Suorin Air pod system are both affordable and long lasting along with providing a certain level of convenience. In short, there are a lot of options. In addition, vaping is a hobby and new technology is being developed all the time. It can be tempting to upgrade to new coils and tanks even if your old equipment is not worn out. This can end up costing you a little more money in the long run. The short answer is that for most people, yes. Vaping is the most proven method of quitting smoking, way above the results for patches, gum, or medication. One of the reasons is that the act of vaping imitates that of smoking, satisfying your physical addictions as well. Also, vape juice can be made with different amounts of nicotine, so you can step down from high amounts to lower ones. As people get more into vaping and the flavor, they generally move toward better tastes and less nicotine. Of course, this answer will be up to you in many ways, and how determined you are to stop smoking. Still, vaping can be a great tool to help you achieve that goal. Of course, if you are going to want to quit smoking, you want to know that what you are substituting for it is safe. The answer though, is more complex than yes or no. The simple version is that vaping in all forms is much safer than smoking. However, there are still certain risks. One is that cheap vape juice can contain harmful chemicals, some of which can form carcinogens when aerosolized into vapor. You do have alternatives though, with organic vape juices and other options that are much healthier. In addition, nicotine itself can be bad for you. However, because you can taper off nicotine and get vape juice with less in it, you can mitigate that risk. Also, the nicotine in many organic juices is pharmaceutical grade, a much purer and less dangerous type than that found in tobacco. The general rule of thumb with vaping is that you should ask before you are told no. This is just showing common courtesy. You should assume that most places where smoking is not allowed will also not allow vaping. This includes restaurants, some bars, and other public spaces. 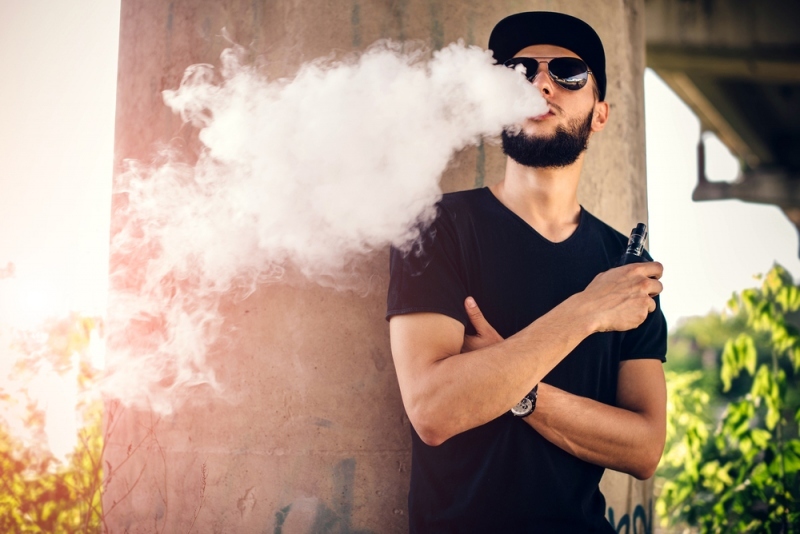 Be sure to check with your job about vape breaks and vaping areas, as you may want to be away from smokers, especially if you are trying to quit, but you may not be allowed to vape in other areas. Remember in the case of vaping, it is better to ask permission than to be reprimanded. Vaping is making inroads in many places, and you don’t want to be part of the reason that stops or even reverses itself. Just be polite. What Kind of Vape Should I Get? The million dollar question, and another one that does not have a clear answer. The thing is, you don’t want a cheap vape that won’t last and will potentially agitate you. This might drive you right back to smoking. At the same time, you don’t want to spend too much, at least initially, until you start to understand what you do and don’t like, and what vapes will fit your style. The most common answer is to look at starter kits and find one that works for you. It will have everything you need to get going, and usually a pretty decent vape. Often, they are ones that can be customized down the road when you are ready for that. You might have even more questions about vaping, but these few should get you on your way to enjoying something new. Join the vaping revolution, and enjoy the journey. Was this article helpful and informative? Leave us a comment with your feedback in the section below.